3.9 out of 5 based on 171 bloggers and 39 commenters. 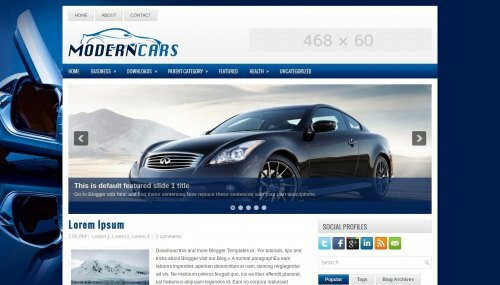 Modern Cars is a free blogger template adapted from WordPress with 2 columns, right sidebar, ads ready, slider, social bookmarking icons, posts thumbnails, tabs and drop down menu. Can any one give me css html version of this template. member of the Bananos family. He was asked to leave from up in the northern states for racketteering in the mid 80’s. From what i see i cant find a original and good blogger designer templates … most from them only copy others work from wordpress. I cant find temlaptes that will not slow down my site. I cant find templates with doctype like the Blogger default templates. I cant find magazine style templates clean and good… i dont want featured content, i dont want scripts, i dont want sublinks for tab. I will remove the footer credit… i can accept link for you, blogger, and original wp designer but i will not acept to mke links for your friends or to have to many links for credit in my footer. And if i remove the credit you cant do nothing no mater what you do … i will change some text and html in the tmplate and you will not be able to prove something. I rspect your work but you also respect me. i want pure and clean CSS and html. i want to control colors because i dont want my blog to look like other guys blogs. TIP: Do not trust or use things like templates made by some1 who have a wordpress blog and not a blogger blog. Carliss your smoking crack that bull crap need to be erased NOW! Anybody know how to remove that box that shows when you link to a lable witht the menu. I have instructions on how to remove it, but they don’t work for this layout. good template an an good work.so i used. @jesus: Hola Jesus! Ya que tu usas esta plantilla. Podrías explicarme (tu o cualquier otra persona que lo sepa) ¿como insertar las entradas nuevas en la pestañita del menú que me interese? Hello I love this Temp. But i have a problem. When i view photos on my blog the Menu bar blocks the view and dose not fade out Plz help! We can use it in commercial?!?! License: This free Blogger template is licensed under the Creative Commons Attribution 3.0 License, which permits both personal and commercial use. Little IMHO: Looked at a lot of pages, and concluded that real good and nice templates appeared only in the second half of 2012.
jQuery Cycle Plugin: Dual licensed under the MIT and GPL licenses. And other content and code what License? Add category “License:” please to all templates’s info here. I really like the theme of this template, and with added ads space it’s a perfect choice for those who are looking for newer designs of blogger templates. Thumbs up for the web design. Why can’t there bo no text editing and no links on the main posts window. Text editing and links are only visible, when I open the post. The template itself is stunning except for this minor flaw. Como faço para que meu Banner ocupe todo o espaço em branco da parte de cima? Hello. Admin How to add image of top banner? Please tell me. nice template.. I like this template. Love this Template, was perfect for my website, Thanks.